If for any reason, someone becomes incapable of making decisions for themselves, a Lasting Power of Attorney (LPA) gives another person or persons the right to make decisions on their behalf. You may wish to draw up a Lasting Power of Attorney for yourself should you worry about what would happen if you became victim of an accident or serious illness. However, for many people, it is as they become older or more infirm that they seriously consider what they would wish to happen to them should their condition deteriorate. This could be because the first signs of dementia or another neurological disorder have been diagnosed or perhaps they have suffered a mild stroke and want to prepare for the possibility of a second, more serious attack. Although you may feel that talking about a future where your loved one is no longer able to communicate effectively could be difficult, if approached sensitively, it can offer all concerned peace of mind. Your loved one can give you precise instructions with regard to any future health treatment; under which circumstances they would wish to be treated aggressively or only with palliative care. They can also let you know if and when they would be happy for their home to be sold to cover care treatment. If your loved one becomes incapable of making decisions for themselves and has not appointed another person as LPA, their personal affairs would become the responsibility of the Public Guardianship office. At the present time, it is estimated that 55,000 people are registered with the Court of Protection who are deemed mentally incapable to act on their own behalf. Their affairs are placed under the jurisdiction of the Court which appoints a Receiver to act on the client's behalf, and the Receiver is answerable to the Court. In practice, if this were your loved one who had a serious stroke, the Receiver would have to be asked to release funds for you to carry out everyday financial matters for your loved one. Not only would you and your family have to come to terms with the grief and emotion of the illness, you would also have the added strain of dealing with officials for every decision. Also, you would have no official say about your loved one's medical treatment even if you knew what their wishes would have been. Although you can apply to the Court to become the Receiver, this takes time and money. And even when you are appointed as Receiver, there are still restrictions on what you can do without the Court's permission. The Court of Protection is important to safeguard the interests of people who don't have close family or friends, but if at all possible, you should ensure that your loved one has appointed a LPA while they are still capable of doing so. 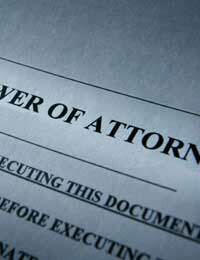 What does a Lasting Power of Attorney offer? Until 1st October 2007, an Enduring Power of Attorney (EPA) gave financial responsibilities to another person should one become incapable of managing one's own affairs. However, since this date, the EPA has been replaced with a Lasting Power of Attorney which covers responsibility for healthcare decisions as well as financial affairs. For example, your loved one may wish you to become responsible for management of their financial affairs and make decisions on which medical treatments should be administered in the case of them no longer being able to make those decisions for themselves. Alternatively, your loved one may wish one person to look after financial decisions and another to manage healthcare issues. The only necessary condition when drawing up a LPA is that the person concerned is in full charge of their mental faculties and able to make the decision themselves. How is a Lasting Power of Attorney drawn up? Many people prefer to employ the services of a solicitor to draw up legal documents although this is not manadatory. LPA forms can be downloaded free online at: www.guardianship.gov.uk/formsdocuments/forms.htm or can be bought from solicitors or even from major stationers. However the LPA is approached, its importance cannot be underestimated for the peace of mind of your loved one and yourself to cover any future crisis. What this article doesn't explain, (and neither does the government website), isthe procedure to enable an Attorney to exercise power once the person making the LPA becomes incapable.Does some third party have to certify that they are now incapable?Is there some documentation required that can be passed (for example) to a Bank to allow access to bank accounts?